China is reportedly making progress in artificial intelligence (AI) surveillance. And according to the New York Times is using the technology to track its Uighur Muslim minority. The facial recognition technology is now integrated into China’s expanding network of surveillance cameras throughout the country. 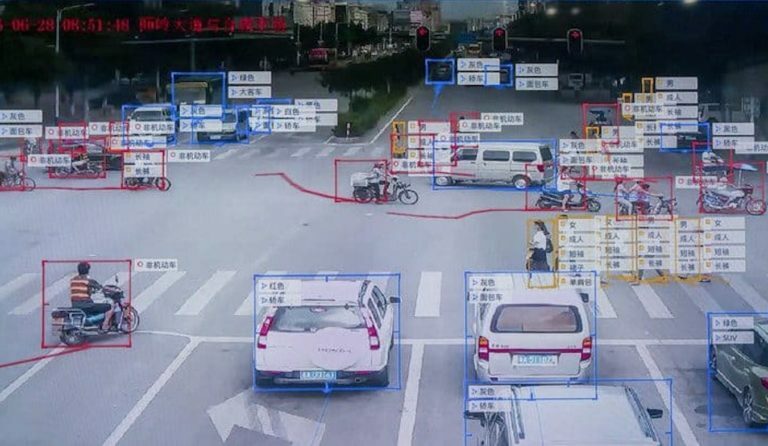 The practice makes China a pioneer in applying next-generation technology to watch its people, “potentially ushering in a new era of automated racism,” the NYT claimed. The NYT cited 5 anonymous sources, who described the technology being specifically targeted against Uighurs. The sources wished to remain anonymous because they “feared retribution.” The NYT also reviewed databases used by the police, government procurement documents and advertising materials distributed by the A.I. companies that make the systems. Furthermore, alleged police documents show that demand for such AI surveillance capabilities is spreading. Approximately two dozen police departments in 16 different provinces and regions across China sought such technology beginning in 2018, according to procurement documents. Law enforcement from the central province of Shaanxi, for example, aimed to acquire a smart camera system last year that “should support facial recognition to identify Uighur/non-Uighur attributes,” the NYT said. Similar tools could automate biases based on skin color and ethnicity elsewhere, according to NYT. The Chinese A.I. companies behind the software include Yitu, Megvii, SenseTime, and CloudWalk, which are each valued at more than $1 billion. CloudWalk and Yitu did not respond to NYT requests for comment. To allegedly allow the system to work, police have put together face-image databases for people with criminal records, mental illnesses, records of drug use, and those who petitioned the government over grievances, according to two of the people and procurement documents, cited by NYT. Using a process called machine learning, engineers feed data to artificial intelligence systems to train them to recognize patterns or traits. The A.I. companies have taken money from major investors. Fidelity International and Qualcomm Ventures were a part of a consortium that invested $620 million in SenseTime. Another technology that Chinese authorities have been applying since October 2018 is gait analysis. MSM hasn’t yet started widely claiming that China has also come to the conclusion that specific minorities walk in a particular way to track them, but that’s probably also just around the corner. The new ‘gait recognition’ software that claims to be able to identify people using their silhouettes and how they walk, even if their faces are not visible. A Chinese surveillance company, Watrix, has developed the new system for gait recognition that can identify people as far as 50 metres away, according to CEO Huang Yongzhen. It can analyse how people carry themselves and, while it is not capable of real-time recognition yet, the company claims it can search an hour’s worth of footage in 10 minutes with an accuracy rate of 94%. The software also can’t be fooled by a person pretending to limp or faking an injury. According to AP, the technology is already being used by police in Beijing and Shanghai. The police are apparently using the software to locate people in crowds and apprehend jaywalkers, with the end goal of developing an integrated national system of CCTV camera data. Huang, a former researcher, said he left academia to co-found Watrix in 2016 after seeing how promising the technology had become. According to him, the technology would also likely be used to help elderly people who have fallen down and are in need of help. AP also didn’t miss any time to jump on the propaganda bandwagon, so it also reported that authorities in Xianjiang also showed interest in the technology. MSM continues to claim that China represses the Uighurs and is sending them to “prison camps,” but at the same time disregards any comments by the Chinese side or reports it has released into terrorist activity in the region. In October 2018, Chinese state outlet Xinhua interviewed Shohrat Zakir, chairman of the Government of Xinjiang Uygur Autonomous Region on issues of counterterrorism, as well as the vocational and training program in the region. The so-called “prison camps” turned out to be vocational camps, in which people at risk of being led to extremism are trained at a vocation and language skills and have a place to stay, until they’re ready to become full-fledged members of society that contribute. “Based on its own realities, Xinjiang has given equal importance to fighting and preventing terrorism, and sought to combine the fight against violent terrorist crimes with the protection of human rights. On one hand, Xinjiang has put emphasis on strictly countering a small number of violent terrorist crimes according to law, and spared no efforts in protecting the basic human rights of the citizens from the harm of terrorism and extremism. On the other hand, Xinjiang has also stressed addressing the root cause of terrorism, and moved to bring around, educate and save the majority of those who committed petty crimes, through assistance and education, to prevent them from becoming victims of terrorism and extremism,” Zakir said. Senior Communist Party of China officials also said that in Xianjiang the authorities must focus on ethnic and religious solidarity. A recent Chinese report also shed some light on counterterrorism activities in Xianjiang. Only a small number of those apprehended faced harsh consequences, mostly those who are ringleaders of armed groups. Others who were simply influenced by “extremist thinking” receive education and training to teach them the error of their ways, the paper said. The World Uighur Congress denounced the report claiming that China was warping the truth. Chinese AI efforts in counter-terrorism and security are often being represented by mainstream media as something aimed at one social group only. This allows mainstream media outlets to speculate on the topic and use it to pressure China on a media front. However, the real practice seems to be a quite different. While this approach may raise some ethical concerns, it is not something employed by China very locally. In fact, Beijing is actively intergrating AI surveillance into its state security system across the entire country. The story began early in the morning when Paul Martin contacted me with a stunning claim that leaders and representatives of leaders from Central and South America were meeting in Chicago in order to plan a “Red Dawn”style invasion of the United States. If it strikes one as odd that such a meeting would be held in Chicago, consider the fact that Attorney General Barr named Obama as a person of interest in the Steele Dossier controversy. The walls are closing in on the Deep State. And the meeting is/was held in Chicago because there is help being rendered (ie treason) from the inside and some of the leadership of the Democratic Party and their Deep State partners are implicated. In a related story, President Trump appears poised to put illegal aliens into so-called sanctuary cities. When the liberal courts rule this unconstitutional, I have it on good authority that the bulk will be put in FEMA camps. When this, too, is declared unconstitutional by the same judges, the camps will still be erected, awaiting new “guests” and if there is a regime change, guess who will be new be the new guests? I took this premise of coming FEMA camp incarcerations to two confidants who have served as anonymous sources in the past. One source, a DHS agent, revealed that hastily prepared FEMA camps are being prepared and/or planned for outside of Houston, Dallas, Austin and San Antonio. In the next article, I will be covering the FEMA camp aspect of this invasion in planning. However, for now, I have enough information from my sources to confirm the strong likelihood that Paul Martin/s source, revealing a covert meeting to plan a Red Dawn invasion is indeed in play and this is on top of the government’s revelation that are an estimated 20,000 terrorists living inside the United States. Did you know that these FEMA camps can be constructed in less than 72 hours? This, too, will be documented in Part 2 along with the mainstream media revelation that the UN is disbanding the Mexican Federales and replacing it with the National Guard under the auspices and training of the United Nations. This is also confirmed by a DHS agent. Another article the Nazi Socialist Dictatorship had removed from the internet. The only difference now than when the article first came out is I said Clinton lost the election by 10 million popular votes, however in further examination, the actual number is 20 million fraudulant votes. The neo-Nazi Dictatorship’s chosen one, Hillary Clinton and their propaganda machine would like us to believe she won the popular vote by almost 2 million. What they are not telling us, is over 3 million of her votes were cast by illegal aliens, almost 2 million votes came from dead people, and almost 3 million people were registered to vote in more than 1 state. Thus, the claim she won the popular vote is a total fraud, given that off the top 3 million of her votes should be disqualified since they were cast by people who are here illegally. So what we have here is Hillary Clinton losing the election by over 10 million popular votes, considering the ones we know about being illegal votes, as well as possibly millions more when you take into consideration the manipulation of the electronic ballots at the polls on election day. Video: Are You a Coincidence or a Conspiracy Theorist? Does Trump Pose a Similar Modern-Day Threat to the So-Called “Elite”? I would call your attention to a “predictive programming” 1975 movie starring James Caan and John Houseman, who looks and acted much like David Rockefeller. In the movie, situated in 2018, six corporations have replaced bankrupted countries and Rollerball, a ultra violent game, reminiscent of NFL Football, is used to placate the people. I have often said that the premise for the free trade agreements, such as NAFTA and the TPP were born in 1975 with this movie. In 2019 as we race to the 2020 election, we are there. In 2016, the TPP was in the process of replacing the US Supreme Court, the Congress and the power of the Office of the Presidency. The corporations are almost there. In the following video clip, fast forward to the 45 second mark and listen for 60 seconds, of John Houseman’s character, presumptively, David Rockefeller, explains how things really work. Trump has done far worse than what JFK or RFK did in the 1960’s when they challenged the establishment. Trump must be a marked man. The 1968 threat posed by Bobby Kennedy, is minor by comparison. If you doubt that this assessment is not accurate, take a look at how the self-appointed elite are lining up against Trump.Every network is producing anti-Trump propaganda 24/7/365 in order to deceive the half of the country that is dumber than a box of rocks. President Donald Trump is thrilled with the findings of the Mueller reported that haunted his presidency for 675 days. But that does not mean he is ready to make nice with the team of angry attorneys who made it their life’s mission to end his presidency. They did not find collusion because there was none to be found, not because they like President Trump and wanted to help him. And it is for that reason, that they did everything they could to find something that did not exist, that he is still enraged. “But I could have told you that and so could most people, and so could have everybody that voted for me, which was a lot of people,” he said. “So, after wasting all of this money and all of this time with people that were haters, people that worked on the Hillary Clinton Foundation, people that were absolutely haters of Trump, they found no collusion,” he said.